The first-person shooter genre has really flourished on modern mobile devices, and up there mixing it with the best of them is Gameloft’s modern combat series. The publisher has quite a few similar titles available for both Android and iOS, but the Modern Combat franchise has easily been its strongest hitherto. Having already developed a strong legion of fans, Gameloft has just gone ahead and teased a trailer for Modern Combat 5, and even though the previous releases have enjoyed high-end, console-esque visuals and gameplay, this latest version appears to have stepped things up once more. Details, as well as that trailer, can be found after the jump! Back in March, Gameloft showed off its first teaser image of the latest Modern Combat, and while that was rather impressive in itself, nothing beats a little teaser trailer. Today, the prayers of avid fans have been answered, and although it’s perhaps not as showy and involved as an in-game trailer (look out for that, ’cause that’ll be the next step), it does at least offer a vague insight into the newly improved graphics. As well presenting the title as looking a tad sharper than its predecessor, the Modern Combat 5 trailer also offers a glimpse into what we can only construe as new missions. 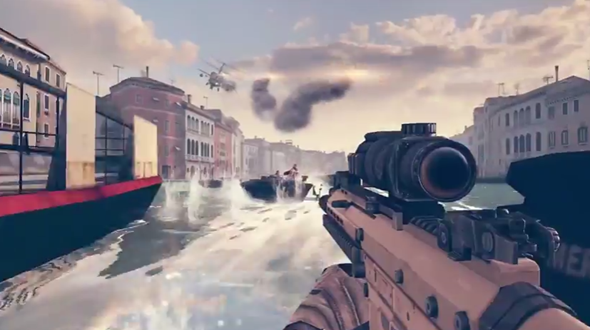 Vehicles such as speedboats and helicopters are hinted heavily in the video you’re about to watch, and if that’s not something to get rather excited about, I don’t know what is! Apart from a few little hints and the confirmation that Modern Combat 5 will be available on both Android and iOS, there’s precious little else in the way of detail. With that said, Gameloft will be unveiling all at this year’s E3 in LA, and with proceedings kicking off next week, we won’t have to wait a great deal of time to find out what else is in store. Are you excited about this title? Please do share your thoughts below! Oh, and you await the release of Modern Combat 5, be sure to check out our iPhone Apps Gallery and iPad Apps Gallery to explore more apps for your iPhone, iPad and iPod touch, and also our Android Apps gallery to discover more apps for your Android device.